Now your thinking, but I have to cut and paste all of that information. That will take forever! Not with another nice WordPress tool called Press This! Just open your WordPress Dashboard. 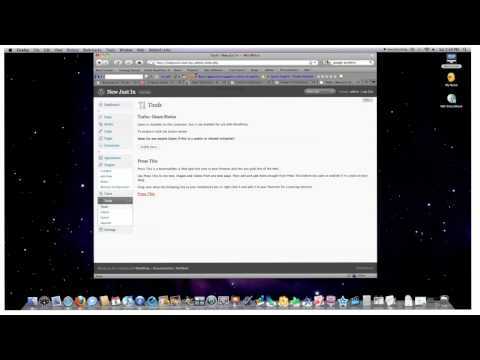 If you don’t have WordPress watch the video’s here to set up your own blog. Ok, now your blog website is setup. Click on tools in your left sidebar. You’ll see a description of a tool called Press This. Follow the directions on that page by right clicking on the link labeled Press This and bookmark the link in your favorites. Click on Press This in your bookmarks. A window will pop up on your screen containing a link to the article. If you selected the text in the article prior to clicking on Press This, you will see that text in the window as well. Fill in any additional text into the article box. Choose a category you want to associate with your new article, or create a new category. Type in keywords that you would like to associate with the article, in the Post Tags box. Finally, click on Save Draft or Publish. It is just that easy to quickly add a great deal of content to your website. I hope that helps save you a ton of time. If you have any questions, comment below! I am having a mid being crisis. I am in my early 40’s and looking to meet a few occasional friends online. I’m kind of a lonely lady and I’d be happy to foregather new people. Yeap, I am sure I am too old to do this stuff, but anyways I want to give it a shot. I also like webdesigning, photoshop and adobe fireworks! Any suggestions, where to start?